Cold and flu season has officially arrived, which means that you're probably doing all you can to keep your family germ-free. But what happens when that fateful day comes and you discover your little one has come down with the flu? Here are a few parenting tips to keep in mind to help your little one get through it. Since this is your child's first time dealing with the flu, you might feel tempted to immediately run to the doctor. 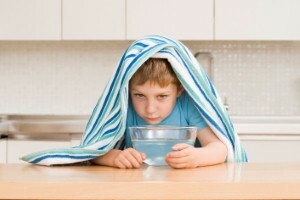 However, you should generally let the fever run its course during the early stages of the illness for older children. For babies and toddlers, head to your pediatrician if the fever is especially high – pushing past 102 degrees Fahrenheit – or lasts for more than a day. A fever is the body's natural way of killing a virus or infection with high internal temperatures, but this can be quite uncomfortable for your child. Fever-reducing medications like ibuprofen and acetaminophen can help kids keep cooler. However, you should be sure to read warning labels about weight and dosage recommendations. It should come as little surprise that a fever can leave your child feeling quite dehydrated, so this should be one of your main concerns in treating the flu. Encourage your little one to drink plenty of liquids, and consider using a humidifier and wet washcloths for added moisture relief.